CAVN Fitbit Versa charger charging dock is made of premium aluminum; bring your Fitbit Versa Smartwatch good charging experience. CAVN Fitbit Versa Charger Charging Dock is made by undergoing hundreds of tests to provide stable and fast charging for your Versa. It will also protect your Fitbit Versa from being damaged by over-voltage and over-current protection. CAVN Fitbit Versa Charger Charging Stand charging port will make the charging easier than original charger coming with the Versa. Simply place your Versa onto the charger charging dock and push it into the charging port, it begins to charge. CAVN Fitbit Versa Charger Charging Dock is custom molded to match your Fitbit Versa Smartwatch charging port perfectly. Whenever you have any issues on our Fitbit Versa Charger charging dock, contact us freely via Amazon message, we will resolve your issue at first time. 1 Packs New CAVN Fitbit Versa Charging Dock. 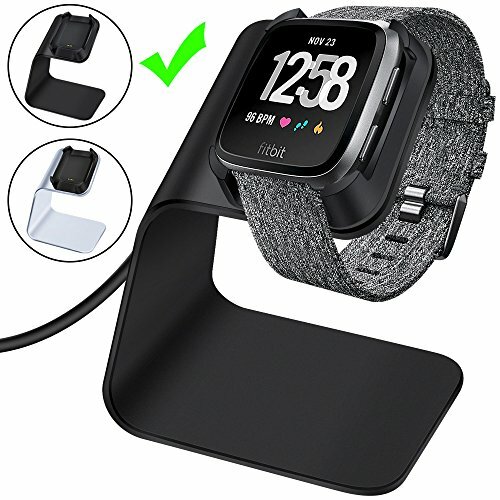 Charging dock for Fitbit Versa Smartwatch ONLY!!! You will get 1 PC CAVN Fitbit Versa Charger Charging Cable Stand. It is Specially designed for 2018 Fitbit Versa Smartwatch. This Fitbit Versa Charger Charging Cable Stand will make your Fitbit Versa charged in a more convenient way without taking the tracker out any more. Just Note: Please take off your Fitbit Versa protective case before charging, this Fitbit Versa charger cable dock won't work with it. Safe Charging: CAVN Fitbit Versa Charger Charging Cable Dock is built-in PCB and made by undergoing hundreds of tests to provide stable and fast charging for your Fitbit Versa. This Charger cable dock will protect your Fitbit Versa from being damaged by over-voltage and over-current during charging. Premium Aluminum Material: CAVN Fitbit Versa Charger charging cable stand is designed with finely crafted aluminum and first-class scratch proof. This aluminum Fitbit Versa charger cable dock is much sturdier than a plastic Fitbit Versa Charging Stand. Easy to Use: The charger port design of CAVN Fitbit Versa Charger Charging Cable Stand will make your Fitbit Versa be charged easier than the original charger that coming with Fitbit Versa. You just need to place your Versa onto the charging dock and push it rightly into the charging port, it will work. Please kindly refer to the third image for detailed guide of using this Fitbit Versa charger dock. 24 Hour Quick Customer Service: Thanks for choosing CAVN Brand Fitbit Versa Charger Charging Dock. CAVN Team are committed to providing quality products and services to our customers. Whenever you have any issues on our Fitbit Versa screen protector tempered glass, please kindly contact us via Amazon message. We will help you at first time. If you have any questions about this product by CAVN, contact us by completing and submitting the form below. If you are looking for a specif part number, please include it with your message.